The Scribble Pad: Let the Season Begin! On Sunday morning, we had finally broken free of the fever than plagues us and headed straight to our local hardware store. Seriously guys, this single small business might be the most redeeming quality of trying to run errands in Washington, DC. They always have everything, including the best selection of Christmas trees from another family business in North Carolina. We snagged a 6 foot tree, two wreaths, 90 feet of garland, three extra sets of lights, bows, hooks and jingle bells. Plus a whole box full of trimmings to make boughs for the doors of the interns on our floor. Our little building is looking mighty festive. I fell in love with pine cones again. 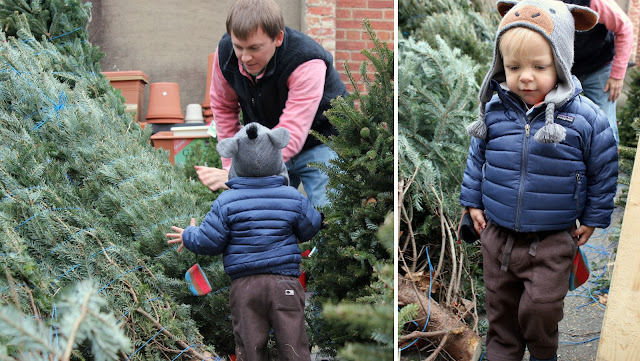 Mark taught Behr how to pick a good tree. Do you see those outstretched fingers? Precious. Behr collected trimmings for the interns. And then he began telling his baby brother all about our morning, going on in a language only the two of them can understand. Whenever Behr talks to my belly, he catches me by surprise. He gets that his brother is in there. He really gets it. In a way I could never have dreamed. 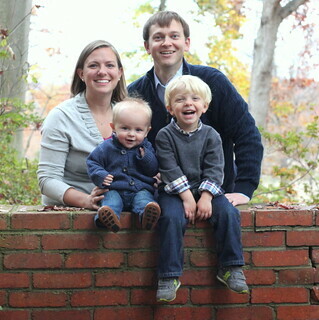 We may not have settled on the name "brother" yet, but that is all he is called in our home these days. And I'd imagine, whatever we name our second born, Brother is sure to stick. I think your blog is my favorite blog to read!